Professional wrestling is always looked at as a wannabe sport, but that’s not stopping WWE from getting the sports-like treatment. WWE All Stars to WWE is the equivalent of what NBA Jam is to the NBA, or what NFL Blitz is to the NFL. If you’re looking for a great wrestling sim, look elsewhere, because WWE All Stars is anything but. What you will get here is over-the-top wrestling, flashy power moves, and fast-paced action. So, how does this arcade-style wrestling title stack up against the long-lasting WWE Smackdown vs. Raw series? Well, read on to find out. 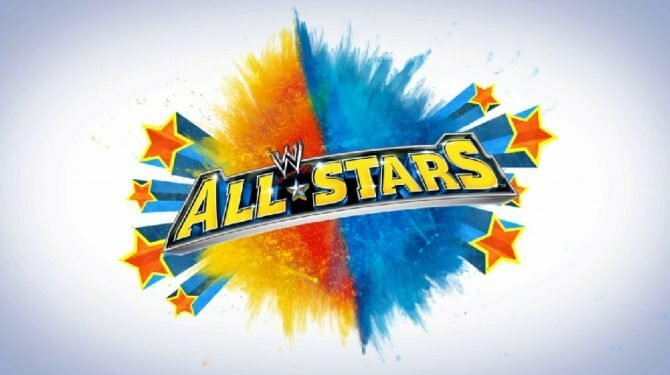 WWE All Stars pits WWE legends and the wrestlers of today against each other in a game that wrestling fans have been dreaming about for (probably) forever. To see Hulk Hogan, The Rock, and John Cena in one game is truly amazing. There is also a generic Create a Superstar mode that will help recreate any of your favorites that you may feel should have been in the game. WWE All Stars is relatively easy to play, which is a good and bad thing. On one hand you have a very simple game to pick up and play. But, on the other hand you have wrestlers with only a handful of moves. 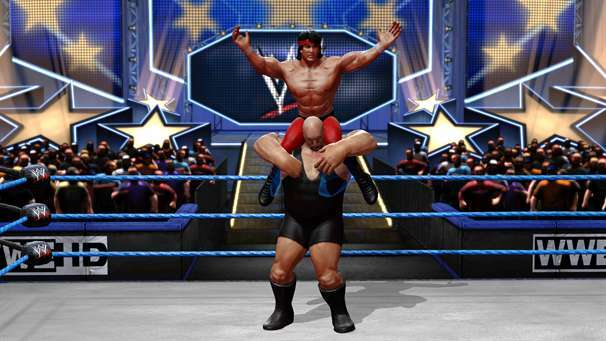 Matches in WWE All Stars are also pretty short compared to wrestling games in the past. Outside of the first few times you play trying to learn all the buttons, matches last for no more than 15 minutes. This is a bit disappointing, because I sometimes look forward to epic 4-player matches that last for a substantial amount of time. The reason matches are short is because victories are not earned the traditional way. More often than not, matches are won via K.O. Pinfalls are possible too, but who needs that in WWE All Stars? As you are inflicting pain on your opponent or doing several reversals (everything in this game is reversible), your wrestler is building both his signature moves and finisher. Signature moves are easier to earn, easier to land, and inflict heavy damage. Finishers take the majority of the match to earn, but, by the time you get one, you’re opponent may be weak enough already to get K.O.’ed by one. Only finishers can end a match this way, and although it is not necessarily an easier way to win, it is much more fun to try and pull off. The game features a couple of single-player modes to keep you busy, but this lasts you for no more than 3 hours. There is a single-player mode called Path of Champions that ties together 10 different matches with cutscenes of the champion talking smack to you. The other mode is called Fantasy Warfare. Here, the game puts together dream matches between WWE Legends and current day superstars. These matches can be played both alone and with a friend, and are even buttered up with video segments are actually put together very well. 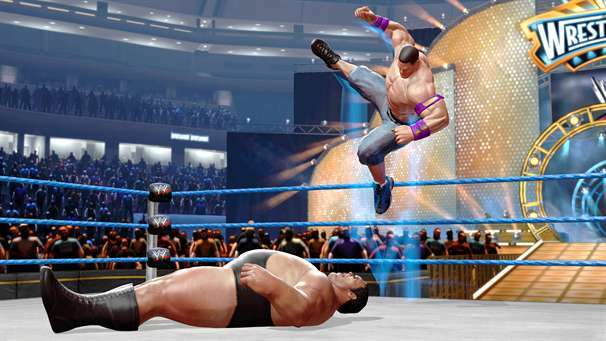 The most fun you will have with WWE All Stars is, of course, with the multiplayer. Playing against friends on and offline is infinitely more fun than playing against the CPU. The game online features the standard stuff you normally see with a game online. You have leaderboards, matchmaking and lobbies, and this can all be done online with up to four players. Unfortunately, the game is pretty limited in the variety department. You will see the same moves being pulled off in a match over and over. Not only that, but match types are also very limited. With such a huge catalog of match types in the WWE, WWE All Stars only delivers 5 different match types. You have regular matches, extreme rules matches, cage matches and elimination matches. That’s about it. There is no Royal Rumble matches, no Hell in a Cell matches, and no ladder matches. 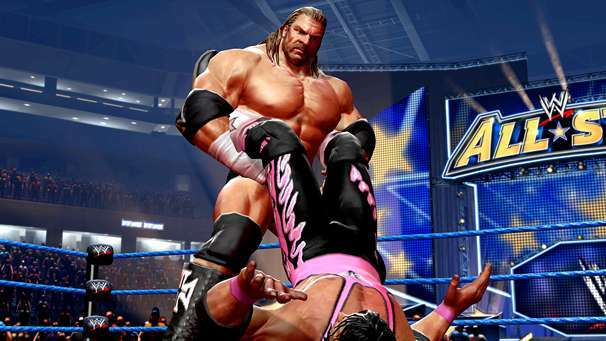 These matches have been standards in WWE games, but are noticeably absent in WWE All Stars. That is a huge disappointment. Other disappointments worth noting include the heavy amount of loading screens, a lackluster presentation, and some minor issues found during gameplay. Loading screens happen about 5 times before you can get a match going. Only 3 times if you turn wrestling entrances off, and this brings me to my next point. Wrestler’s entrances are boring and shortened compared to what they actually do on TV in real life. With a game so over-the-top, it would have been nice to see over-the-top entrances. Imagine pyrotechnics that explode so big that the wrestling ring actually caught on fire? That would be cool. Lastly, matches could have been done a little better. The announcers, Jerry “The King” Lawler and Jim Ross, repeat their generic comments over and over during a match. It would have been nice if these comments were just a little more personalized. Not only that, 1 vs. 1 matches have signature moves shown in slow motion, and that looks very cool. Four-way matches don’t do this, because it would get annoying to have to slow down the match every time a signature move is used, and that is understandable. Unfortunately, after a four-way match has dwindled down to the last two, the game is unaware of this, and still continues showing signature moves at regular speed. Very minor, but something I picked up. 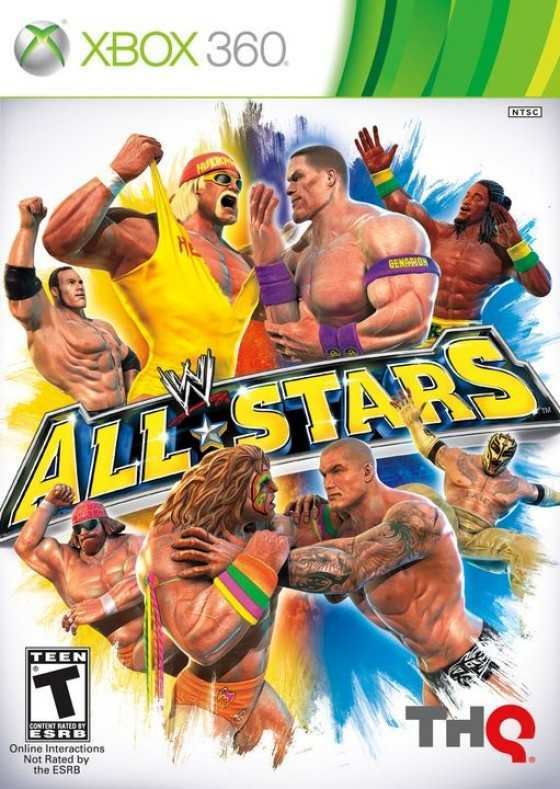 Overall, WWE All Stars is a very fun game, and it is a refreshing new take on the WWE videogames. Unfortunately, the game leaves you wanting more, and you know they could have easily included more. The fact that almost a dozen superstars are scheduled to be downloadable content should be a huge indication of that. Wrestling fans, pick this one up. Everyone else, this game is worth taking a look at. Review Copy Info: A copy of the title was provided to DualShockers Inc. by the publisher for the purpose of this review.